In the bivouac at La Paz today there was no rush and little noise of running engines. It was a moment for riders to catch up on the sleep that they’ve missed over the previous days and a chance for the mechanics to work on the machines. The Monster Energy Honda Team readies itself for the crucial second and final week of the racing. The balance sheet of the first six days of racing reads positively, with two stage victories for Joan Barreda and the overall leader board currently topped by Kevin Benavides – both riders with strong chances of clinching the outright prize at this Dakar 2018. The first week was an arduous task, but both the Honda CRF450 RALLY and the riders endured the strains without any setbacks. Ricky Brabec rode some fine stages in Peru, as did Michael Metge, although the Frenchman dropped time after being sanctioned for failing to validate a waypoint point due to an instrument failure. A worthy mention also goes to young José Ignacio Cornejo, who replaced the injured Paulo Gonçalves at the eleventh hour, who has adapted quickly to a previously unknown motorcycle with very solid results. The team is now preparing for the second week of racing and can expect eight tough stages across both Bolivia and Argentina. The first part, with rain and mud forecast at an altitude of over 3500 metres, and the second, with desert areas such as those of Fiambalá or San Juan. Tomorrow competitors will tackle the first of the marathon stages between La Paz and Uyuni, featuring 425 kilometres of special stage followed by a night in the bivouac where no external mechanical assistance is allowed. The second leg of the marathon will finish up on Sunday in Tupiza. Monster Energy Honda Team has been able to devote themselves to preparing the 2018 Dakar thanks to the support of various collaborators and team sponsors. Principally Monster Energy, which gives the title to the team. Furthermore, Monster is in the race with two vehicles: a support truck and a press 4×4 vehicle. Their energy drinks, such as the new Monster Hydro, provide glucose and vitamins and help reduce fatigue. Another of the great collaborators, Motul, supplies all the oils, lubricants and cleaning material for the motorcycles. In this Dakar, Motul has brought a laboratory truck to analyze the oils used by the bikes. The riders rely on Michelin tyres to face the Dakar, with the French brand offering a range of different tyre types and the ‘mousse’ that competitors rely on to make it safely through hundreds of kilometres. Showa has put a mechanic at the disposal of the team, exclusively dedicated to the suspensions of the five Honda CRF450 RALLYs. GIVI also supports the team with specific technical materials. The mandatory survival kits are supplied by the Italian brand, as are the essential handguards for the stages in altitude where temperatures can drop below zero. Italian brand Termignoni manufactures the top quality exhaust pipes and silencers that adorn the Honda CRF450 RALLYs of Barreda, Benavides, Metge, Brabec and Cornejo. The riders outfits are supplied by is Alpinestars, which provides the highest quality and comfort required. The plastics are provided by Acerbis and other bike components and equipment used by the team are supplied by such technical collaborators as ARC, Beta tools, DID, FCC, GAT, Kiron, Kyocera, Laika campers, Insect Shield, Moonfactory, Nissei, Noguchi seats, Peli technical boxes, PIAA, Renthal, RPM Films, Shindengen, Supersprox, Toray Carbon Magic, Urban Tucano clothes, Twin Air, Vibram shoes, Wings and goggles 100%. 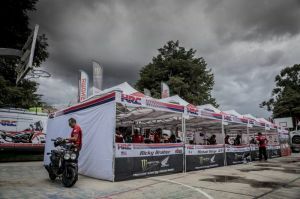 Equally essential to the Monster Energy Honda Team is the support from the Honda family itself: Honda Peru has collaborated with the team during the first part of the race, offering infrastructure and logistics, and likewise Honda Motor de Chile and Honda Argentina.